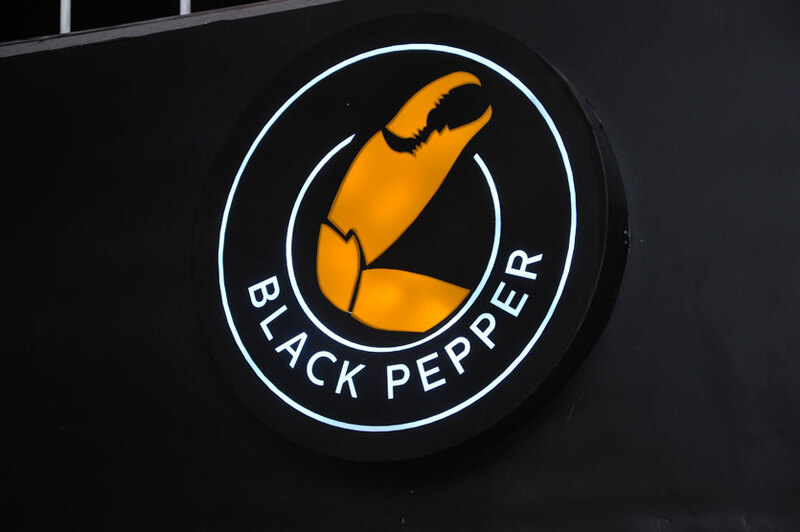 Located in the heart of Colombo, the Dutch Hospital Shopping Precinct now offers a new fine dining experience at the all new ‘Black Pepper’ restaurant. Having launched earlier this month, the restaurant is under the ownership and management of the Earl’s Court Group and stands to be the first restaurant opened by the group. Black Pepper is a multi-cuisine seafood restaurant offering a range of seafood from every part of the country. 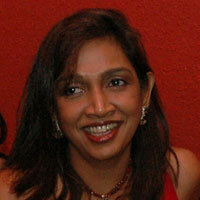 The restaurant’s executive chef, Chef Chandana, was the first chef to open a crab restaurant in Trincomalee. 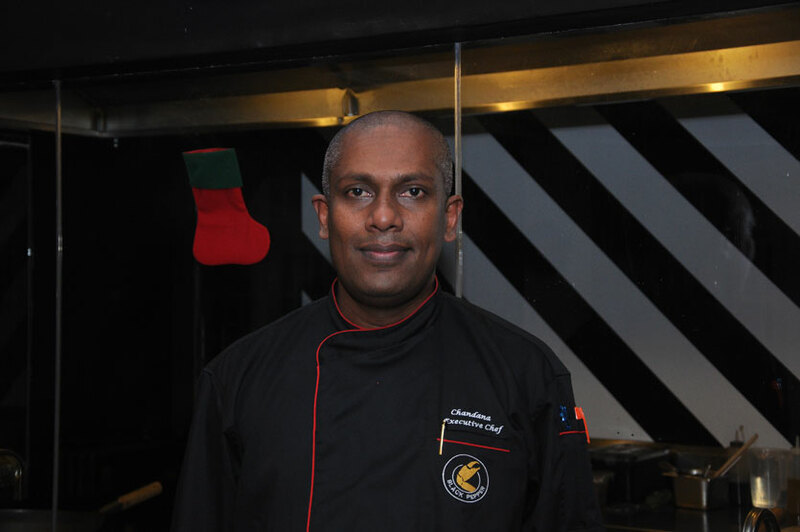 With a culinary experience spanning over 22 years and having worked abroad in countries such as Maldives and Kuwait, Chef Chandana has carved out a name for himself as a master executioner of seafood cuisine. Following a theme of black and white, the restaurant is elegantly designed and spaciously furnished. A bar is docked at the corner end of the restaurant and a massive wine rack is displayed center stage. 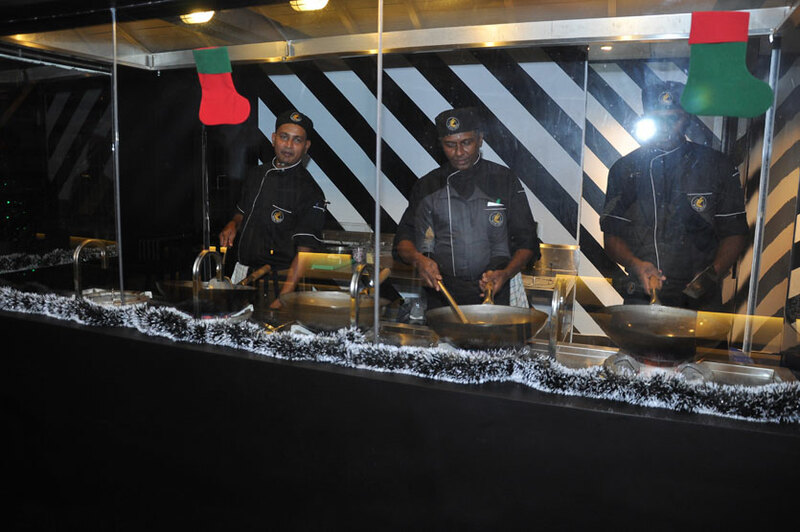 The restaurant also follows an open kitchen concept in which diners can watch their seafood dish being prepared by a team of experienced chefs through the glass paneling. 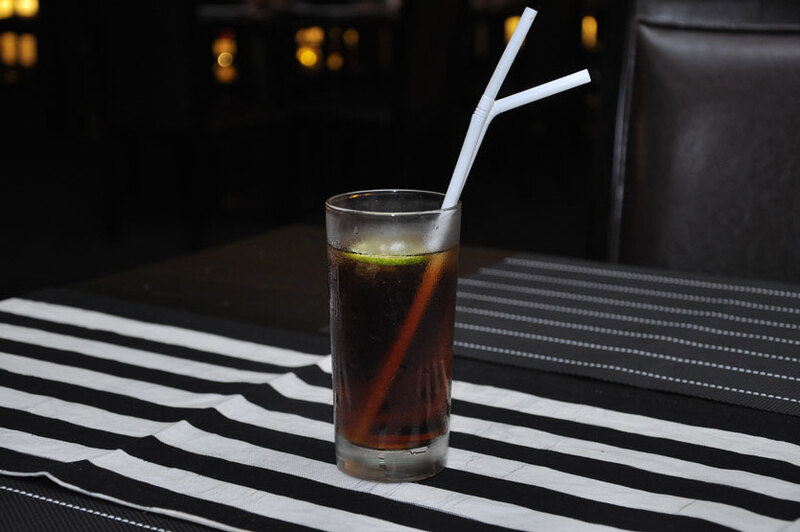 With a fully stocked bar, the restaurant has its own beverages menu. From alcoholic to non-alcoholic beverages, the menu has enough variety to allow the diner plenty of options to choose from. There is an extensive red and white wine menu to be bought either by the bottle or by the glass. Wine has always been the perfect complement to seafood so the options are many. At our visit we opted for a cocktail and an iced tea. We ordered their Blue Magaritta at Rs. 1000 and their Peach Iced Tea at Rs. 350. 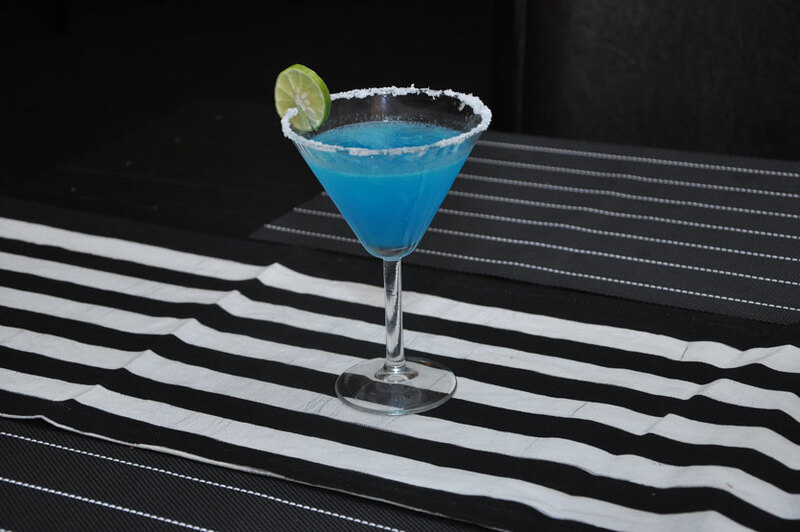 The iced tea was strong in the flavour of tea and had a heavy consistency to it that we loved and the Blue Magaritta was the perfect blend of tequila, lime juice and blue curacaco. The menu at Black Pepper is simply crafted by the Chef. Chef Chandana explains to us that the menu draws influence from all four parts of the island. Crabs from the North, Prawns from the East, Fish from the South and other meats from the East. And if the restaurant name wasn’t a giveaway, the black pepper corn is the star of many of the dishes. Ideally, the diner chooses one of the seafood dishes, be it crab or prawns or fish, and then order a few carbs to go along with the main dish. We started off with an appetizer, the Green Avocado and Tiger Prawns with Wasabi Mayo at Rs. 660. 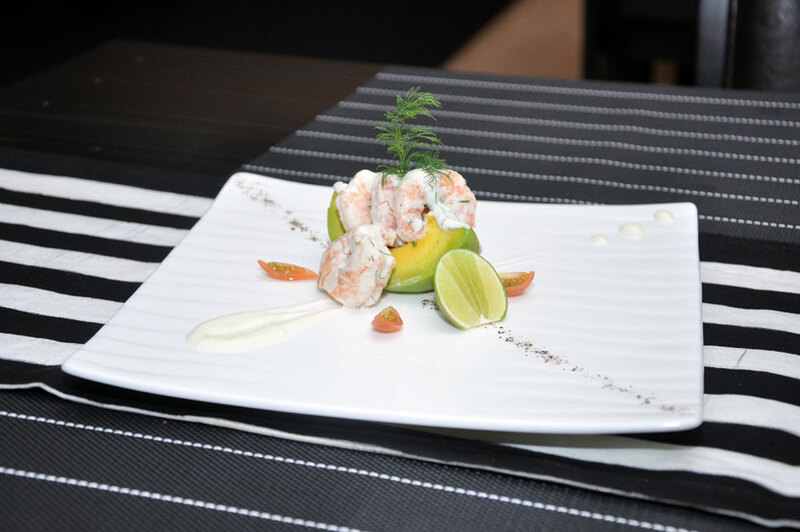 The dish is 4 big prawns served on fresh avocado drizzled with Chef’s wasabi mayo. The mix of something chewy and something soft with the prawns and the avocado was a perfect pairing and the wasabi mayo added a touch of spice to the overall flavour of the dish. The menu doesn’t really offer much for vegetarians as it is a seafood specialty restaurant. 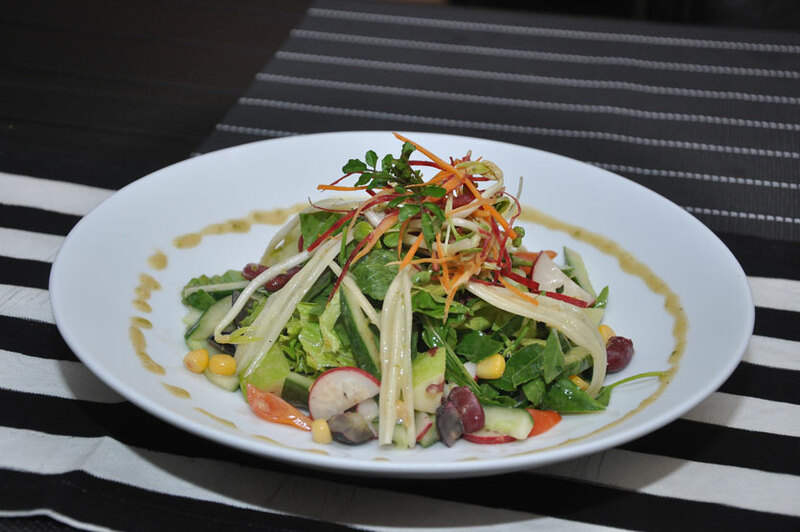 The only vegetarian option was the Chef’s Special Mixed Salad with Kochchi sauce at Rs. 980. The salad was an amalgamation of a variety of ingredients such as tomatoes, kidney beans, corn, grapes and handful of greens such as spinach, rocket, lettuce, pennywort and many more. 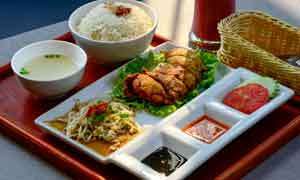 The Kochchi sauce however was the star of the dish delivering a punch of heat to the salad. As for our mains, we ordered the Prawns in Black Pepper Sauce. 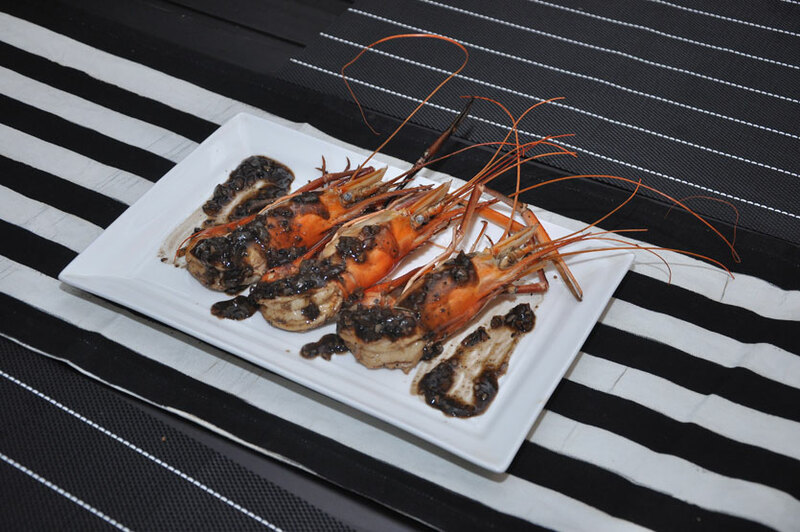 The dish includes 3 jumbo prawns in its shell marinated with the black pepper sauce. The black pepper sauce was not as hot and heaty as I expected but the prawns were well steeped and marinated in the sauce. 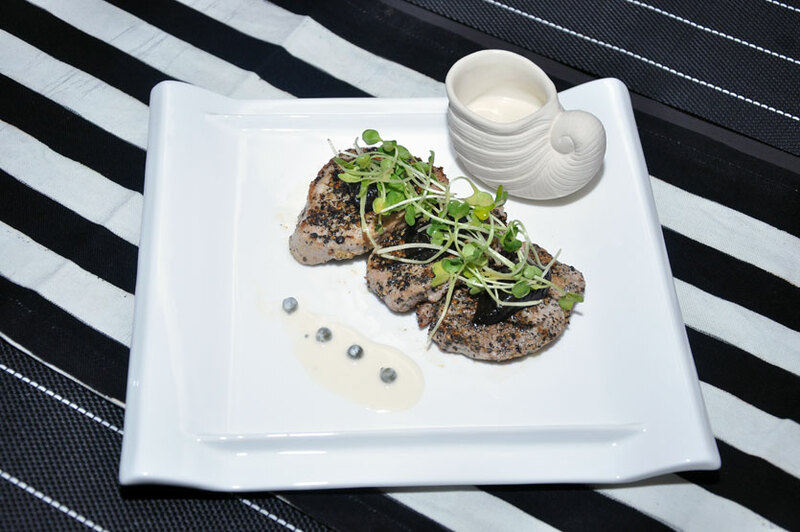 We then tasted their Grilled Black Pepper Yellow Fin Tuna Steak served with a white sauce. Served with Shitake mushrooms on top, this black pepper tuna definitely packs a punch. Well-cooked and flavoursome, this dish is recommendation for anyone looking for something spicy. As for our final main, we had their Hot Garlic Crab. This freshwater crab is massive in size and the meat in the crab was fairly generous. Combined with the hot garlic sauce, we couldn’t get enough of the crab! Having checked all our boxes in terms of flavour, spice and overall taste, it was easy to say that the crab dish was our favourite. 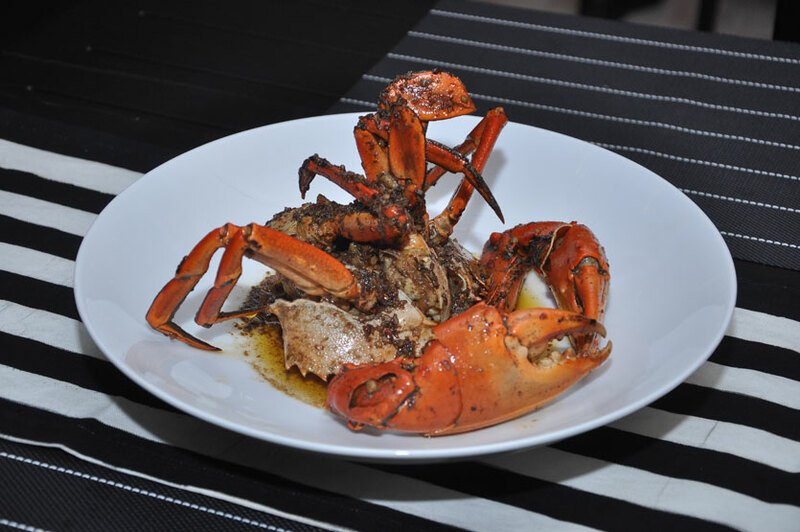 However, if you choose a crab dish, prepare to get your hands messy because this is not a dish to be eaten gracefully! 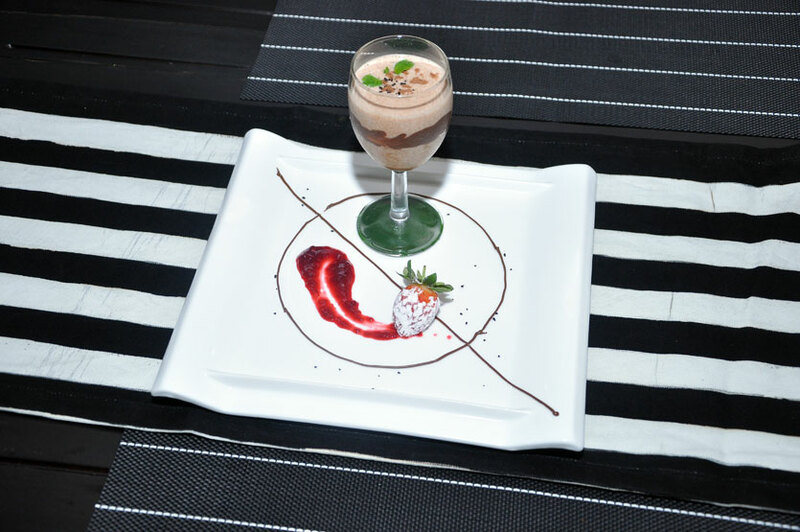 To finish our meal and cleanse our palattes, we wrapped up our meal with a dessert. The Woodapple Mouse with Wildberry Compote is priced at Rs. 480 and is artfully presented. This woodapple mouse however is of a thin consistency rather than the usual thick consistency but was a sweet dessert to finish the meal with. The service at Black Pepper is extremely fast. Food arrived to the table within 15-20 minutes of ordering when usually restaurants take a good half an hour. The staff at Black Pepper is extremely courteous and pleasant and checked in for feedback on the dishes every once in a while. Black Pepper is a restaurant waiting to be discovered. Their seafood is packed with flavour and their dishes are generously portioned. 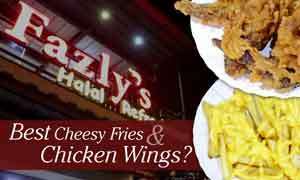 The ambience at the restaurant is chic and upscale and affords the diner a sense of privacy. Their menu is promising with a small variety of seemingly tasteful dishes but their crabs are most definitely a must-try recommendation!